I try to avoid pre-release publicity, even trailers, as much as possible, but inevitably one gets blasted with the Internet news firehose no matter how much one tries to avoid it. 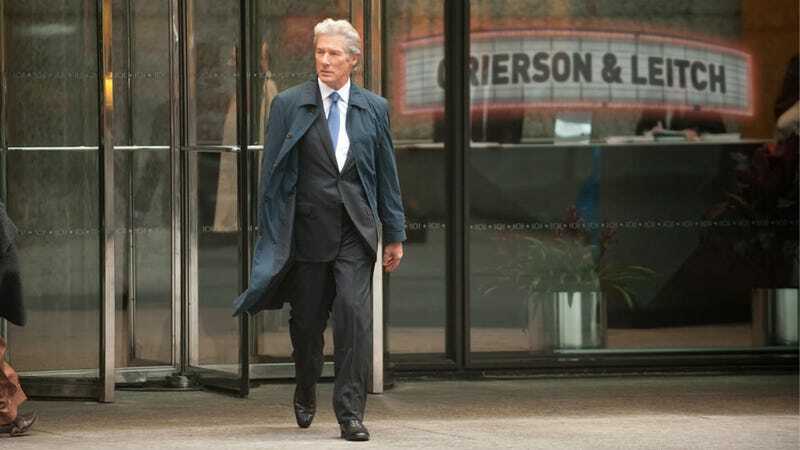 So I knew that Arbitrage, which opens Friday, was supposed to be a thriller about a hyper-wealthy hedge fund manager and that it was supposed to feature Richard Gere's best performance in years. Those things were intriguing to me; Gere's one of those actors who seems underrated yet never is in anything good. The thing about Arbitrage, though, is that it isn't an expose of how the one percent live, or how they see the world, or what effect their lives have on the rest of us. Gere's Robert Miller is essentially indistinguishable from the countless wealthy, handsome, sensitive-but-also-unseemly your-grandmother-loves-him roles he's played over the past two decades. He has a loving family, he has an affair, his life looks temporarily in low-risk peril—this could have been directed by Adrian Lyne. The movie tries to tack on the one percenter subtext to feel current, but this is basically another Richard Gere white-people-problems movie. It does, however, provide a helpful guide on how to avoid trouble if you are, in fact, a member of the one percent, and you happen to have accidentally killed your girlfriend in a car accident, and you want to cover it up so your company can complete a merger. (Hypothetically speaking.) How do you beat the rap? Let Richard Gere show you how. 1. Know a black guy. After Gere's hedge-fund manager has a fatal accident with his illicit artist lover in upstate New York, he drags himself to the nearest payphone and calls Jimmy Grant, the son of his old driver, the one black person he knows. It's bizarre that Gere calls Jimmy, who is an upstanding law-abiding person, has no real connection to Gere, and hasn't even talked to him in years. The only reason Gere calls him, that I can tell, is that he's black and ... I dunno, maybe has dealt with this before? It makes no sense, but the movie never calls Gere's character on it; it's just, you know, part of the plot. Jimmy, as one does with hedge fund managers who call you collect at 3 in the morning to help you drive away from the scene of the crime, comes to help out, and then gets arrested for his troubles. Gere doesn't seem to mind that much; he has his own problems. Key lesson: It is helpful to have black friends to take the rap for you, and it's particularly helpful if this doesn't bother you that much. 2. Don't pretend to have a perfect family. In fact, don't bother with the family. If it looks like you have a perfect family, you don't, and it A.) just makes everyone want to come after you; and B.) inspires that perfect family to come after you once you're in any financial danger. Susan Sarandon is the happy, devoted wife; Brit Marling is the brilliant CTO daughter. They will both try to end you by the time the movie is over, and you'll have to say things like, "Everything I did, I did for this family!" No one will believe you when you say this. You're better off going all Ron Perelman, getting married six times or so, buying off all the ex-wives and making sure nobody has any Ozzie & Harriet pretenses. 3. Accept a lot of awards, but faux-humbly. Any time you accept an award, it makes everyone believe you are a great man, and therefore they will believe you incapable of killing your mistress in a car crash. This also allows for a lot of ironic movies scenes in which someone introduces you as a wonderful person; turns out, the audience knows otherwise! Dramatic juxtaposition. 4. Stay in your car. In the vastly superior Cosmopolis, Robert Pattinson spends a whole day in his limo moving across town. Gere has some scenes in his car, too, which have the same effect as they do in Cosmopolis: They show how powerful you are by making people come to you. Remember: You can get away with lots of things if people fear you. Stay in the car! There are scary people out there. 5. Work exclusively with Graydon Carter. The company Gere is trying to merge with has a CEO played by Vanity Fair editor Graydon Carter, for reasons I can't possibly fathom. (Maybe he promised a free article about the movie? Is that worth anything anymore?) Richard Gere and Graydon Carter were born within a month-and-a-half of each other in 1949. They do not look it. Ultimately (SPOILER ALERT! WEE! ), Gere gets away with everything, and we're supposed to cluck and scowl at the injustice of it all. I found myself just wanting to watch Cosmopolis again. This is a movie that actually loves the wealth and the distance that wealth provides from the ruffians in the rest of America. But that's not what Arbitrage thinks it is, though. Arbitrage thinks it's a skewering of the cupidity of the one percent, a symbol of The Way We Live Now. I don't. I think it's a symbol of The Only Type Of Movies Richard Gere Has Made Over The Last Two Decades. He looks great, though, I'll give him that.